Ballyhale Shamrocks' Richie Reid, TJ Reid, and Eoin Cody celebrate. ©INPHO/Tommy Dickson. Eoin Cody hit a dozen points for St Kieran's as they overcame holders Dublin North to advance to the Leinster PPS 'A' SH final earlier today. 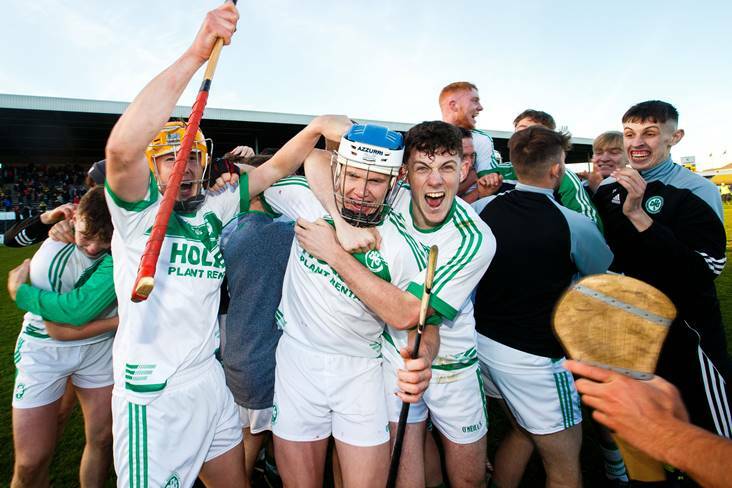 Four days after he helped his club Ballyhale Shamrocks reach the All-Ireland SHC decider with a haul of 1-4, including a crucial second-half goal, against Ballygunner at Semple Stadium. The Kilkenny school gained a measure of revenge for last year's final defeat to their Dublin opponents by running out comfortable 2-22 to 1-10 winners and Cody's 0-12 tally was central to the 15-point victory in Portlaoise. A nephew of ten-time All-Ireland SHC winner and Ballyhale manager Henry Shefflin, 19-year-old Cody is set for a busy four weeks between school and club commitments.